Saving for retirement can feel intuitive (Save money in good accounts.) while spending retirement money can feel confusing. If you don’t know your safe withdrawal rate, the chances are that you’re either spending too much or could spend more. 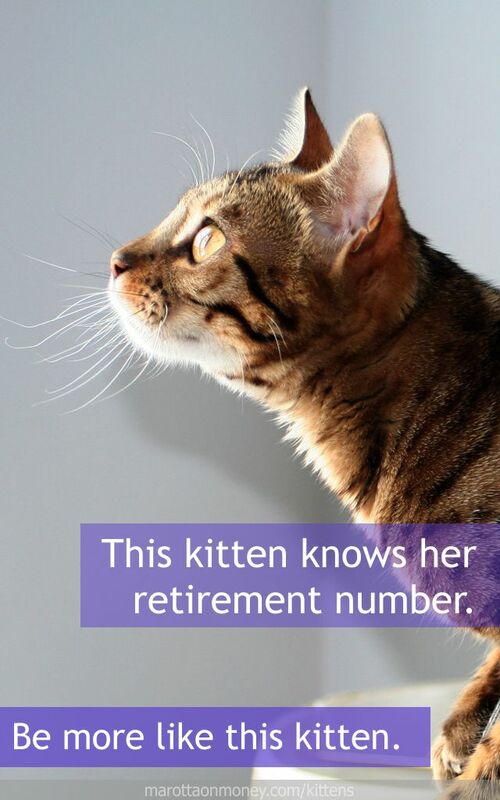 This kitten knows her retirement number. She asked Marotta Wealth Management to assist her in designing the appropriate investment balance to match her needs and now knows how much each year she is allowed to spend such that financially she can live to 100 without changing her standard of living. The retirement number simplifies the retirement part of retirement planning. It means that at age 65, you can safely assume that you can withdraw 4.36% of your account and still have your money last your lifetime. The retirement number also is something that can be calculated for even younger retirees. If you’ve done well at saving for retirement, then retiring at age 40 (safe withdrawal of 3.38%) is possible if your standard of living fits in that amount of money. This kitten retired at 50 and hasn’t had to change her standard of living since. Photo of Mel taken by Rosana Prada used here under Flickr Creative Commons.